There are seven days left until the election. The morning starts with good news, my rival has accidentally stirred up a huge scandal in the banking district. It improves from there as I lay on the charm -about 4k gold coins of charm- onto an influential patron within the rural, mines district. My three campaigners are put to short work too, as my preacher raises funds in a region 100% behind me, whopping a massive 20k for my campaign, meanwhile my activist rallies undecided voters in the farm district, and my lawyer clears a scandal that had stirred up when I’d started a relationship with a mourning millionaire to secure some funds, and their backing of my campaign. Did I mention yet that I’m a crocodile? My campaigners are a turtle, a hound, and an owl, and my bitter rival is a bulldog in a bowler hat? 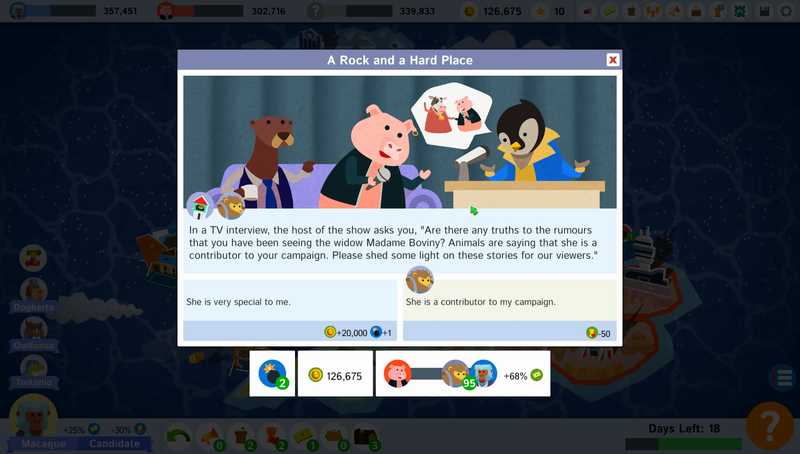 Political Animals, then, with it’s bright cartoon characters, chipper upbeat music, and stylish yet simple UI, attempts to distil the almost universally misunderstood theatre of politics; to dilute that theatre of distractions, spin, and damage control into something cheerful and easily digestible. In this it does a great job; the media are neutered and their polls accurate, a lawyer can wash away scandals with them never to return, and the people will vote based on local influential figures and policies, rather than anything else. Ultimately, it makes for a fun, bite-size take on politics, but unfortunately for the developer it’s at a time when people’s involvement and interest in politics is peaked, and vitriol is high. Once the political turmoil has settled and resolved, this could well be the succour many need to numb themselves to the dirtier sides of lobbying and the political machine. Vote Croccy the bad-mouthing, tasteless -yet efficient- candidate for you! Each game begins with you selecting an animal to play as, choosing their specialities and personality, picking your campaigners, selecting a map, and setting up your opposition. There’s difficulty indicators when setting up the opponent, as well as the ability to set up their morality – which governs the level and type of interference their campaigners will set out to do to you. 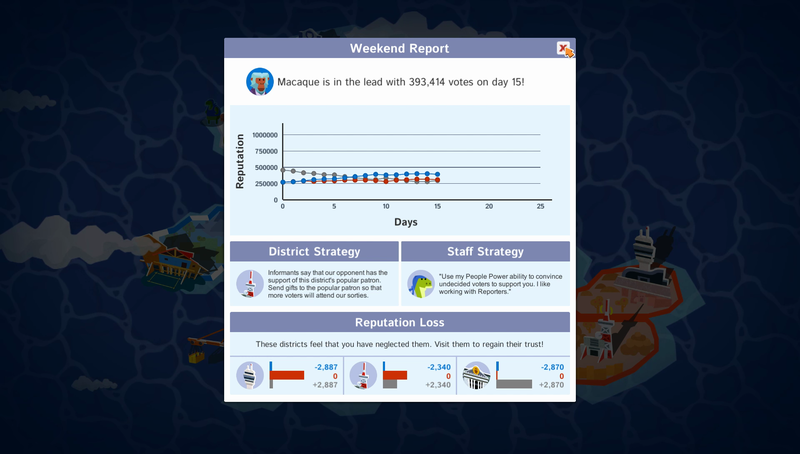 On first play there are a few maps and animals (playable, not campaigners) locked away behind winning elections in the available maps, otherwise everything else is fully unlocked and available to play. I do, personally, feel that the game would have benefited from having certain personality types paired with certain animals, and a progression or scenario mode to unlock further characters. As it stands it only takes four games to have unlocked all of the options, and while playing as a Macaque is something I’m sure most will want to do, there’s little pushing people to challenge themselves further with the game. Weekly updates like this not only serve to give you a clue as to what to do next, but also indicate that local districts have refilled their donation coffers. The amount of control that the game gives you over your initial set up is, frankly, nigh overwhelming, and with no quick-start functionality (although there is a well-made tutorial included) it becomes clear that there’s a fair bit more depth to the game than the visuals might have inferred. That said, after a few games, by the time you’ve gotten used to the mechanics and critical points of the game, you can completely game the set-up in most cases; setting up your character to start with the highest population area on your side, and distant, or vast, districts already leaning towards you thanks to your stance on policies. The pig from the Capital city with the big clock opposed by the Macaque from Norther… nah, lost it there. Finally, in the set-up options there’s the ability to set starting campaign coffer size, and select how long the campaign trail goes on for. In these cases it’s 15-30 days, and from 75 to 300k respectively. Even in the case of picking the most generous extremes, there is just not enough time, nor place, to win by a full 100% victory. You see, money is the true crux of the game, and while 300k might sound like a lot, it really isn’t. Money is a total enabler in the game, as it is in it’s real world counterpart. With almost every action -fund raising, a few special actions, and movement- requiring either an amount set by certain nearby variables -influential figure’s opinion of you, proximity to won states, etc- or an amount that you dictate on a slider, normally affected by the same variables. With the cap of each slider at 20k, and only a certain amount of time to impress upon the nation, you’ll could have already eaten through even the biggest coffer in four turns, phew. Of course, the aim of a solid plan is to drop the money where it is most useful to yourselves. I have failed to mention thus far that all the campaigners have awesome names, and most little pop-ups are fantastic, ‘dad-joke’ animal puns. Each of the districts on the island is different, not just geographically, but in the fact that the undecided voters are influenced by your stance on policies that matter to them, when you last visited and the amount of scandal that has followed you on the national stage. That is, however, the undecided voters come election day. The districts are also comprised of an already allotted voting population for each party at the start of the game, and three influential patrons – symbolic of celebrity, wealthy, and connected members of the community. These influential patrons affect the amount of people eager to rally behind you, the amount of money available in the area for you to fundraise, and the ease to operate logistically in the area. Each of these patron’s opinions are on sliders, with yourself on one end, and the opposition leader on the other. So, that’s the lay of the land. 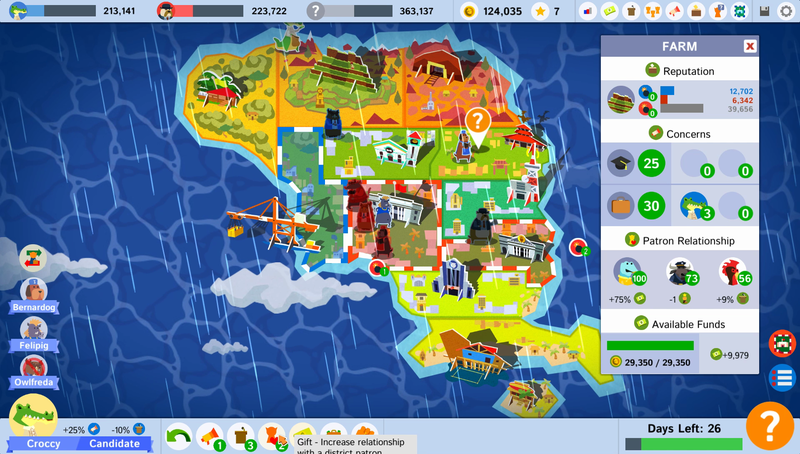 You set out, each game, into the nation to try and win over patrons, and then use the advantages they give to win over voters and secure areas; if you can win over all three patrons and the majority of the voters than the area locks down as very secure; this makes any actions of the other faction tougher to do well with, and gives you a bonus specific to the area. As it stands you start with your starting area already completely in favour of you (so picking a high population area will benefit you) and I’ve spent a game messing around trying to break my rival’s hold over their starting area and it’s nigh impossible, and not worth fighting for — the battleground is the undecided voters. Letting them do it seemed like a good idea at the time officer. Movement, and actions, throughout each of the game’s ‘Day’ turns, is managed by logistics, a limited resource symbolic of the amount of effort and influence your team can do in a day, in areas where you control the patron tied to logistics, things cost less, in the case against they -as you would imagine- cost more. There are several ways to get more logistics each turn, for a start there’s a character who can generate logistics -for a price- depending on where they are, there’s also the pot-luck events system that we’ll get to later. Actions include rallying people to believe more in one of their two concerns, sending gifts to patrons, campaigning to secure undecided voters, bribing local officials to secure voters in general -at the risk of scandal- and fundraising. There’s also each of the character’s special abilities; the activist’s protest orientated one was very useful to my legal, legitimate campaigns, with it expending logistics rather than money to rally undecided supporters. There’s also a police officer who can barricade an area, as well as a thug who can lock-down one of the opposing co-campaigners. Gambling away the highly valued education concern of the people is a bad deal for me in the case, but that dapper money does certainly have a way with words, and the money could be useful. Then it gets interesting, because the scandal side of the game -which is very easy to skip-over if you never decide to engage it- comes alive within the remaining abilities. The Lawyer can make scandals disappear, meanwhile other abilities can further investigate an open scandal, while another issues a report on it which can massively damage the target’s reputation (directly related to votes) if allowed to fully play out. This is the best way to crack open a district, and can completely change a game’s direction if the two abilities play out in an area rife with scandals. Apparently I’m somewhat of a saint. Once you had picked and developed a play-style that works well for you there’s little outside of the competition’s own tactics that would have stalled you or caused you any problem — that is, was it not for the game’s events. Every couple of turns an event bubble pops up in one of the districts that you are operating in. As a fan of Paradox Interactive’s games I’m inclined to compare the event’s system to that of Crusader Kings II, in that the events are transparent on the effects they will likely endow upon you, although many later return with follow up events that give further spin to the situation, and can completely twist any plans you had in store. One that regularly crops up for myself is the event I touched on in the intro to this piece; at a party your candidate meets up with a recently widowed, cow who happens to be the wealthiest animal on the island . You are presented the chance to have a fling with them, or offer your condolences the latter will gain you some influence with the local wealth patron, while the former will give you money, greater influence and a couple of scandal points in the area, A couple of scandal points are easily washed away by a lawyer for a lot less than the 50k you score for taking a trip with the widow, and the influence ensures you can grab more money from the district’s coffers should you need it. Several turns later, however, a member of the press –possibly not the one you might well have made disappear when they started investigating you– has latched on to the story, and an interviewer on a show you’re talking on asks you about the rumours. You now have a situation where you can stand by your relationship, gaining further scandal points and more money, or you simply proclaim they are a contributor to your campaign; throwing them and their feelings under the proverbial bus and taking a massive hit to your influence over the district’s wealth patron. A 50% influence loss is enough to render fund-raising in a district useless, and possibly weaken your foothold enough to allow your rival a chance to chip away at your lead. While I’ve seen a couple of events occur quite frequently now, there’s enough of a mixture, and there’s enough going on in the game, that the game achieves a decent level of replayability, even if there is -unfortunately- no multiplayer, and no vanity unlocks in the game. 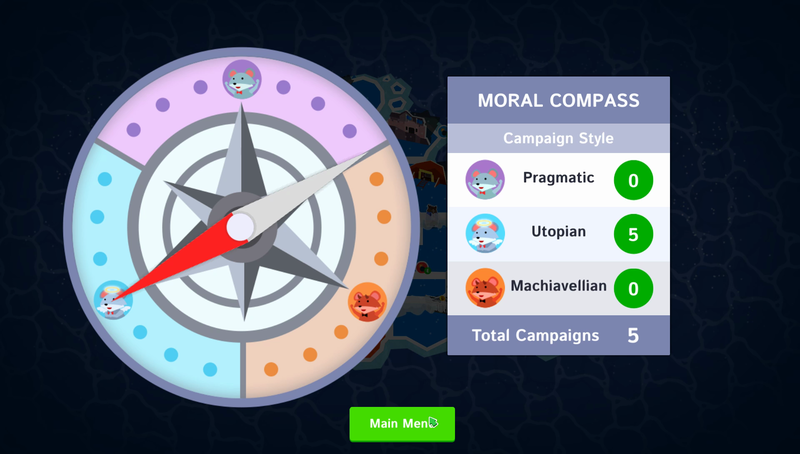 Despite a few shortcomings, Political Animals is a cheerful, fun take on politics, if you have the patience for turn-based games then you’ll find it very hard to turn the game off mid-campaign, although after a few plays you might find yourself less compelled to return to it due to the lack of multiplayer and unlocks. It’s wealth of campaign set-up options, and variety of events, however do give you a great reason to boot up another game once you’ve finished up, win or lose.